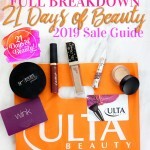 Check out what’s left of the 2018 Ulta Beauty 21 Days of Beauty sale. Which Is Better: Sephora or Ulta Beauty? Hear my thoughts on the two biggest beauty retailers, and check out the top beauty blog posts of the week from the Lipstick League.